I decided to visit a close-to-home favorite location of mine a few days ago, Pictured Rocks National Lakeshore. 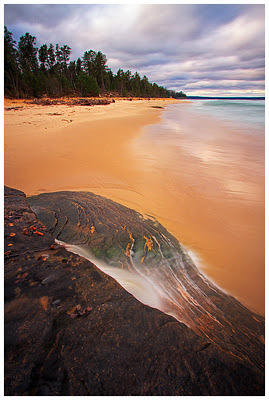 The Pictured Rocks is only 45 miles from the City of Marquette where I live. Making this location a must on days where the weather might turn towards drama. Drama usually comes with difficulties and this day was no different. It was terribly cold and windy, making it a real challenge to work close to the water. Technical details: Canon 7D, Canon 10-22mm lens (@10mm), 3-stop neutral density filter, 2-stop reverse graduated neutral density filter, ISO 200, F/16, Three shot HDR, middle exposure at 8 seconds.